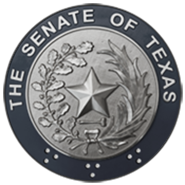 (AUSTIN) — Review of the supplemental budget turned to discussions about Hurricane Harvey recovery and how the federal shutdown is affecting state agencies at the Senate Finance Committee hearing on Wednesday. For the latter issue the answer is: not much, according to Legislative Budget Board Assistant Director John McGeady. He says that most agencies that depend on some level of federal funding still have plenty in reserve, though that becomes less certain should the shutdown persist through the end of February. Some agencies have staff that are paid with federal funds, and McGeady said that agencies have been able to cover those wages with state funds. He expects that they will be able to recoup those costs once federal funds start flowing again. Lubbock Sen. Charles Perry said that Harvey recovery efforts demonstrate the need for a unified, statewide flood mitigation plan. As for Hurricane Harvey recovery, Finance committee members talked not only about how to pay for recovery but also how to prepare for future events. Harvey dumped up to 60 inches of rain, the most ever recorded in the U.S. from a single storm, on the Texas Gulf Coast in August and September of 2017. Damage estimates for the storm top $125 billion, making it the second most costly storm in US history, after 2005's Hurricane Katrina. The state has or will pay out millions for recovery efforts in the current biennium, and those costs have to be balanced on state ledgers. That's where the supplemental budget comes in, and it includes $1.2 billion in state funds, some drawn from the Rainy Day Fund, to pay for recovery efforts in the current fiscal period. McGeady laid out for the committee how those funds are earmarked in the first draft of the supplemental budget. The lion's share, $900 million, is for public schools. Part of the first $300 million goes towards holding districts harmless for loss of student population due to the storm. Since districts get education funding based on daily student population, losing students displaced by the storm hit local school district budgets hard. The rest is for compensatory education costs, that is, students who get more funding from the state due to some hardship. The storm increased the number of students eligible for this status, and the state must cover that cost. The remaining $600 million would go to cover the loss in property value caused by the storm. Since Texas funds education based on property taxes, if property values go down due to storm damage, that eats away at local school budgets. The final amount of funding to cover this loss in value and where it goes will be up to lawmakers to decide. The discussion then turned to additional issues, not only to recovery but to prevention. 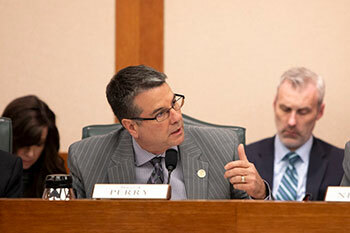 Lubbock Senator Charles Perry, who chairs the Senate Water and Rural Affairs Committee, studied the issue of a statewide flood plan during the interim. He cautioned his fellow members. "We can end up like a New Orleans, that still doesn't have recovery because nothing was done with oversight, coordination and collaboration "Perry said. "We need to leave here with a statewide flood plan with oversight and accountability designated for local, state and federal partners." He has filed a bill, SB 396, which would direct relevant agencies to develop a statewide plan for future flood mitigation, including provisions for regional cooperation, by 2024. One area where the federal shutdown is impacting Texas citizens is in the flow of FEMA money towards Harvey recovery, said Brenham Senator Lois Kolkhorst. She said that in conversations this week with Nim Kidd, Chief of the Texas Division of Emergency Management, he warned her that every day of the shutdown could mean the loss of two days worth of funding. Kolkhorst raised concerns about how this could impact coastal districts. "It's kind of shut down and we're at a standstill on the housing issue that we see in my district, and then also some of the other FEMA funds that could come to our local communities for mitigation and for repair" she said. This is an issue that's out of state lawmakers' hands, as they wait for a resolution in Washington D.C. The Senate will reconvene Monday, January 28 at 3 p.m.